Truck Drivers are vital units in logistics and transport which support the trade. They surely are the well-known strength and power of the logistics business. The Indian logistics in the past had a large quantity of truck drivers, but the condition is set to change radically as the industry is facing an unmatched scarcity of truck drivers. This is possible to turn into an increasing difficulty that will damage the growth of Indian Trucking industry. The foremost reason for this problem to happen is also the occupational hazard that goes along with trucking. Truck drivers ply around 300 kms per day on bad conditioned roads, joggling along these wobbly roads, the unfortunate drivers travel 24-25 days in a month, supplemented by a sole ‘helper’ and accommodated in a rough, overheated driving compartment. Also, due to the unorganized nature of the logistics industry in India, attached with improper anticipation, now the trouble is set to undertake severe extents. Truck drivers are also bothered about their own protection as security on the nation’s highways is conspicuous by its absenteeism. Highway patrolling and a help-desk are alternatives that have been skeptically overlooked. The growth of the Indian Logistics industry in every sense depends on the trucker drivers. With most merchandises being transported by road, a scarcity of truckers could terminate the expectations and visions of the Indian commerce. Both the government and industry administration must identify this necessity and immediately upgrade the working atmosphere of its drivers to give the industry that much-anticipated push to swing ahead. While the Western Nations are at present facing the unavailability of truck drivers, the Indian trucking industry also finds itself ogling at a difficulty which can be dodged with good resourcefulness. Mahindra Navistar has taken the initiative to train and develop new truck drivers to aid this problem in the industry. 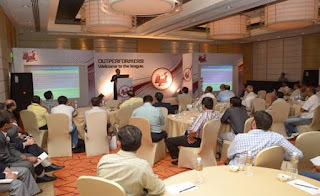 Furthermore, the discussion forum - “Outperformer’s League” from Mahindra Navistar is evaluating this problem along with important members of the Indian Logistics Industry.